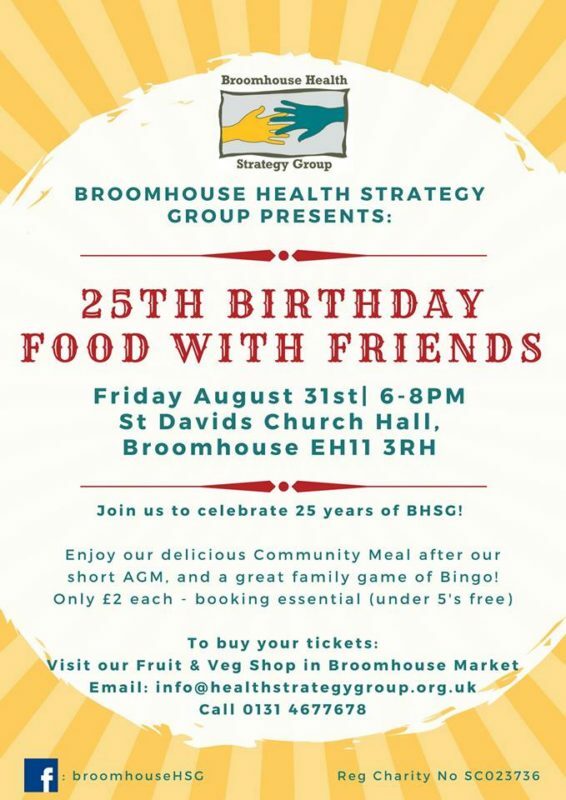 The Broomhouse Health Strategy Group will be holding a Food with Friends evening during their AGM at St Davids Church Hall, 6.00pm – 8.00pm, celebrating their 25th birthday. Enjoy our delicious Community Meal after out short AGM and a great family game of Bingo! Tickets cost £2, under 5s go free, and booking is essential. The theme for the food is vegetarian Indian cookery, please let them know when you buy your tickets if you have any dietary requirements. You can get your ticket by dropping in to the Fruit and Veg shop or speaking to a member of their team during any of their sessions. For more information contact info@healthstrategygroup.org.uk or 0131 467 7678.